An interpreter’s job involves the spoken language only. While the translator has the luxury of using translation aides such as dictionaries and computer programs, an interpreter has to verbally translate what one person is saying in one language into a another language for another person to understand what the first said. In essence, an interpreter echoes what one person says but in another language. According to the U.S Bureau of Labor Statistics (BLS), interpreting careers will continue to grow at an average rate of 2.9% per year. 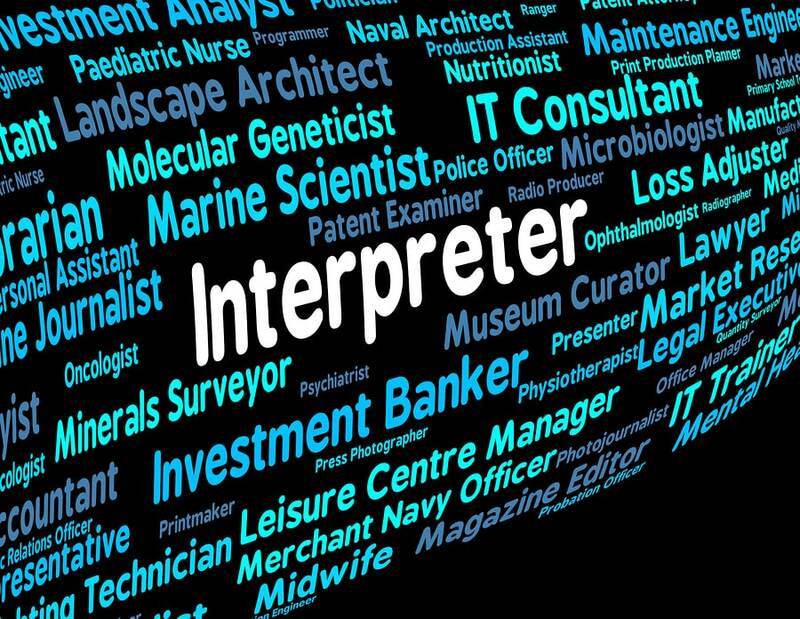 What Areas of Interpreter Career Specialization are More Lucrative? This is a highly specialized field and those doing interpreting work here are thoroughly scrutinized. Why is this important? It is vital because administration of justice in a court of law is dependent on accurate interpretation of information. Accurate interpretation means getting accurate information from the patient and the doctor. This results in making the right diagnosis and prescribing the right treatment. The hearing impaired persons are not effectively served by interpreters. Qualified professionals for this area are few and so the demand for services is higher than the supply. Big global organizations like the EU, UN and WHO need interpreters on an ongoing basis and in many parts of the world. Those working here and in the diplomatic fields generally make more money than those operating in general interpretation jobs. Trade talks and deals involve heavy monetary and other forms of investment. Accurate interpretation of such discussions is important and interpreters working here earn more for their services. A thoroughly vetted, trusted and accurate interpreter who is ready to risk getting shot at is a great asset to security personnel operating in areas where language communication is a problem. This is also true where military related negotiations are involved. Specialist interpreters in this field earns much more but they may have to move to other locations and the job consistency may not be as consistent as in other comparatively less paying interpreting specialties. All these areas of interpreting specialization need high levels of skill and generally deal with topics that need the highest degree of interpreting accuracy possible. Level of education. A bachelor’s degree together with an interpretation professional certificate creates a foundation for more and better paying interpreting jobs. Some cities have better prospects than others. In the U.S, such cities include Los Angeles, New York, Washington DC, and San Francisco. Language combination and demand. According to the BLS, there is a projected increase in Spanish speaking people in the U.S and interpreters in this language will continue to be in demand. In addition to specializing in a specific well-paying interpreting niche, the following qualities are important.